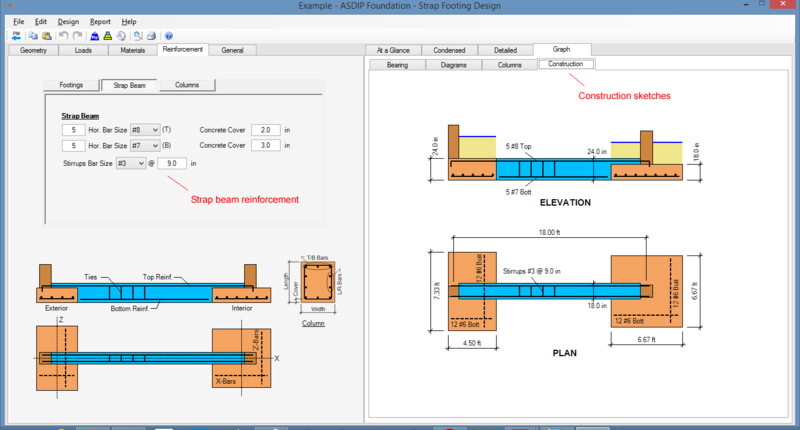 ASDIP FOUNDATION is a structural engineering software utilized by engineers for design of concrete foundations, such as spread footings, strap footings, and combined footings, per the latest ACI 318 provisions. 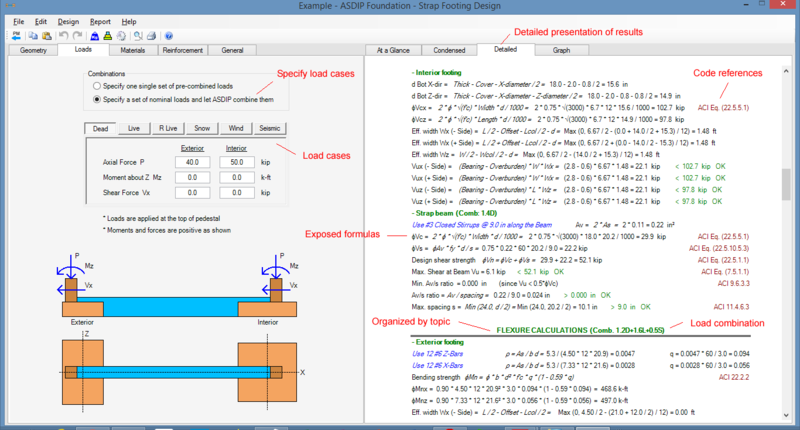 ASDIP FOUNDATION substantially simplifies time-consuming calculations for structural engineering design. Load combinations per ASCE 7. 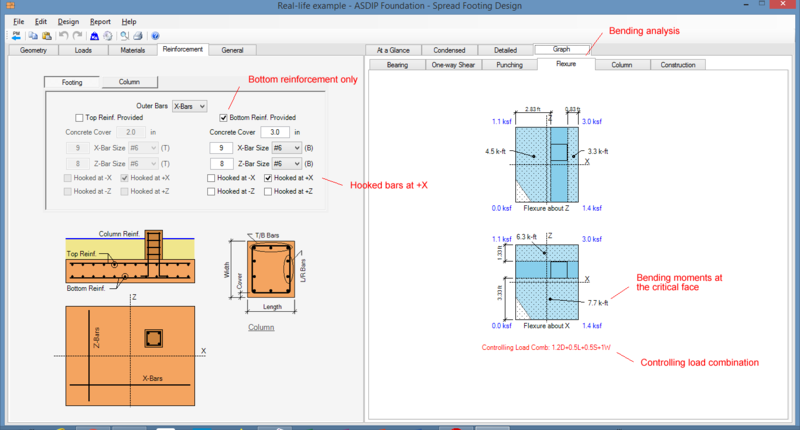 Quickly model your concrete footings with the simple and efficient graphical user interface. Use your valuable time wisely while ASDIP FOUNDATION does the hard work for you. After using this engineering software for a few months I believe it works very well for its intended purpose. ASDIP is very simple to use, is reasonably priced, and the calculation output is organized with a nice looking readable layout. 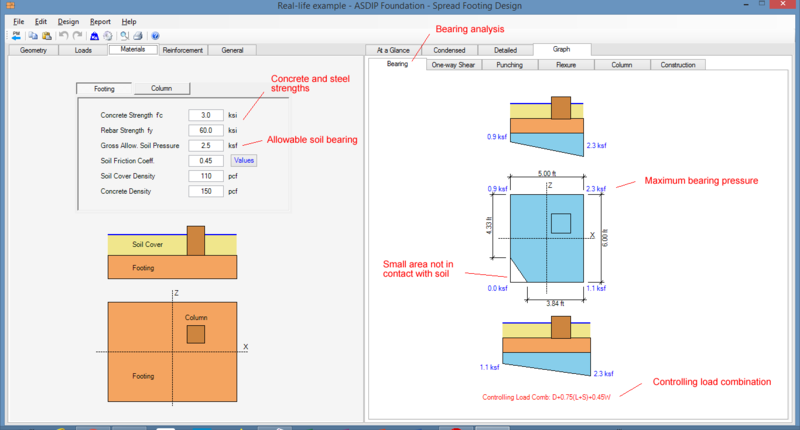 ASDIP FOUNDATION structural engineering software computes soil bearing pressures induced by a square or rectangular spread concrete footing subject to vertical load and biaxial moment. 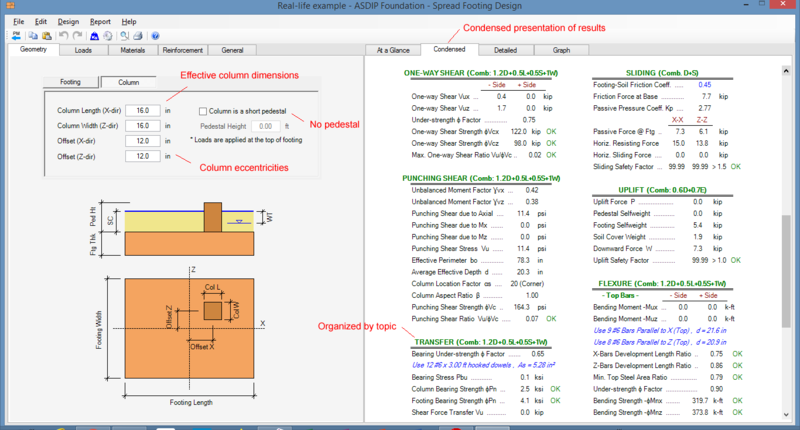 This structural engineering software analyzes stability of structures for overturning, sliding, and uplift. 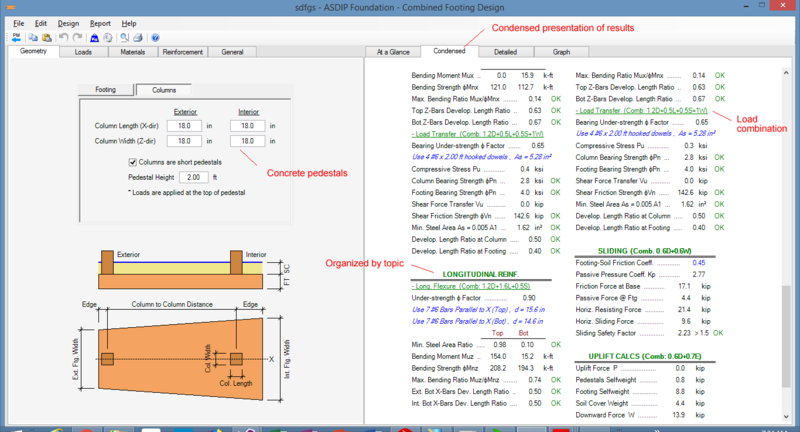 The software performs concrete design based upon Ultimate Strength Design Method within ACI 318. Load combinations occur per ASCE 7. Columns may be eccentric in two directions. The footing is assumed to be perfectly rigid with constant thickness and rotates about its mass center to maintain equilibrium of forces. 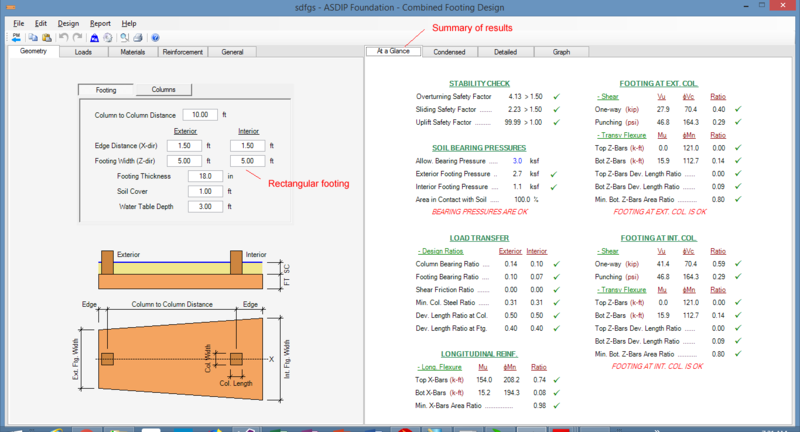 ASDIP FOUNDATION can calculate the soil pressures under the footing with any service load combination including uplift loading. The pressures may also be calculated when only a part of the footing is in contact with soil (partial bearing). This is especially useful when a footing with small vertical load and big moments is being designed, such as a footing at the corner of a building under lateral loads. The input options are straightforward and logically presented in tabbed pages. The required input data includes the footing and column dimensions, material properties, allowable soil bearing pressure, and acting service and factored loads. In addition, the software accepts a number of load cases, such as dead, live, snow, wind, and seismic to be combined internally. Modeling a single set of pre-combined loads is also possible. The program checks the footing stability in overturning, sliding and uplift for the service combined loads, and performs the concrete design, which includes the one-way shear, punching shear and bending for the factored combined loads. In each case the controlling load combination is identified and reported. In case of partial bearing, the software accurately calculates the bearing pressure distribution on the base of the footing. The one-way shear, the punching shear, and the bending moments are calculated based on the bearing pressures under the factored loads. The program uses a sophisticated algorithm based on integrals to find the areas, volumes, and centroids of these irregular resulting geometric shapes. A detailed step-by-step report is available to the touch of a tab, which is updated with every new change. In addition, ASDIP FOUNDATION uses a pre-formated colorful text-with-values output for easier identification of the problem areas. 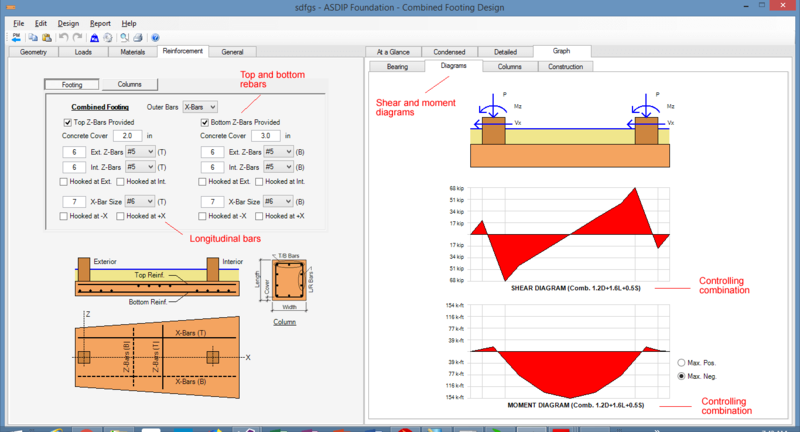 ASDIP FOUNDATION generates a graphical view of the designed footing and the resulting pressures and forces. The program also generates the moment and the shear plan views for the controlling combination, as well as a view of the construction section and elevation with the reinforcement information. A strap footing is one that usually supports two columns, and therefore is a special type of combined footing. If a property line exists at or near the edge of an exterior column, an isolated footing would be placed eccentrically under this column and it would tend to tilt. Overturning of the exterior footing is prevented by connecting it with the adjacent interior footing by a strap beam. The use of a strap footing may be justifiable under conditions where the distance between columns is large and a large excavation area must be avoided. It is common practice that the bottom surfaces of the exterior footing, the strap beam, and the interior footing be at the same elevation, but the thickness of each element may be different, depending on the strength requirements. 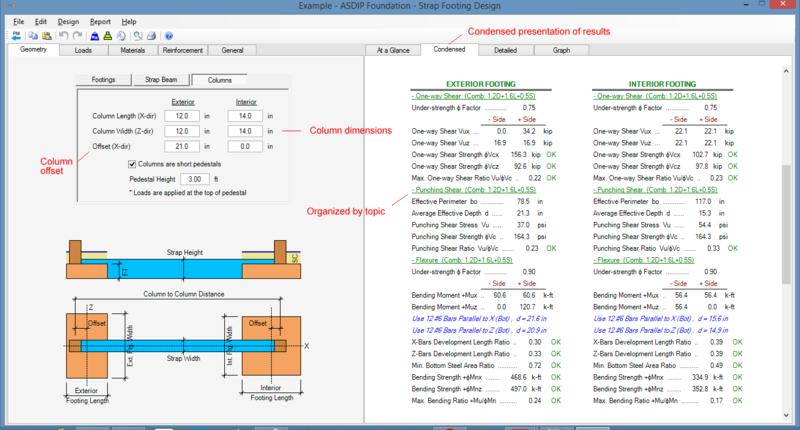 This software computes the soil bearing pressures induced by a strap footing under the action of vertical loads and bending moments, per the latest ACI design criteria. It designs the reinforcing steel for the interior and exterior footings, and checks the one-way and two-way shear stresses. 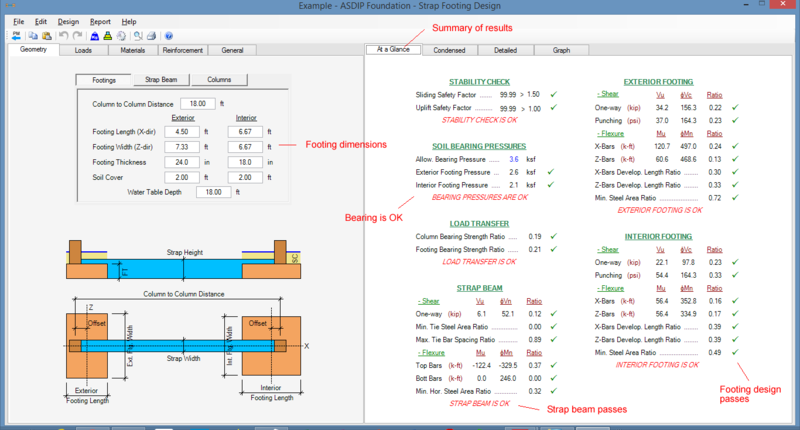 In addition, the program generates the shear force and bending moment diagrams in order to design the reinforcement for the strap beam. The concrete design is based on the Ultimate Strength Design Method of the ACI 318. Load combinations per the ASCE 7. Both columns may be eccentric in the longitudinal direction. The input options are conveniently organized in tabbed pages. The required input data includes the footings, strap and columns dimensions, the material properties, the allowable soil bearing pressure, and the acting service and factored loads. In addition, the program accepts a number of load cases, such as dead, live, snow, wind and seismic, to be combined internally. Alternatively, you can model a set of pre-combined loads. This module checks the overall footing stability under the service combined loads and performs the concrete design of the two footings and the strap beam, which includes the one-way shear, punching shear and bending moments under the factored combined loads. In each case the controlling load combination is identified and reported. For a quick overview of the design results click the “At a Glance” tab. A more detailed step-by-step calculations are available at the “Detailed” tab, which is updated with every new change. In addition, ASDIP FOUNDATION uses a pre-formated colorful text-with-values output for easier identification of the problem areas. Use the Print Preview command to see a preview of the pre-formatted report on-screen, which includes the color graphics generated by the software. 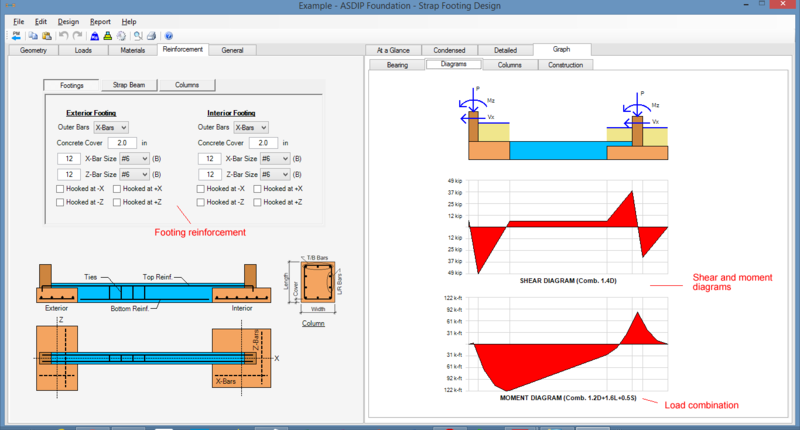 ASDIP FOUNDATION generates a graphical view of the designed footing and the resulting pressures and forces. The program also generates the moment and the shear diagrams for the controlling load combination for granular checking, as well as a view of the construction section and elevation with the reinforcement information. A combined footing is one that usually supports two columns. If a property line exists at or near the edge of an exterior column, an isolated footing would be placed eccentrically under this column and it would tend to tilt. Overturning of the exterior footing is prevented by supporting the two columns on a common footing. The use of a combined footing may be justifiable under conditions where the distance between columns is short and the stability of an exterior isolated footing would be compromised. It is common practice to size the combined footing so that the resulting soil bearing pressure is uniform. To accomplish this, the footing shape is sometimes trapezoidal or rectangular, depending on the loads. A combined footing is usually analyzed as a beam in the longitudinal direction and as a footing in the transverse direction. 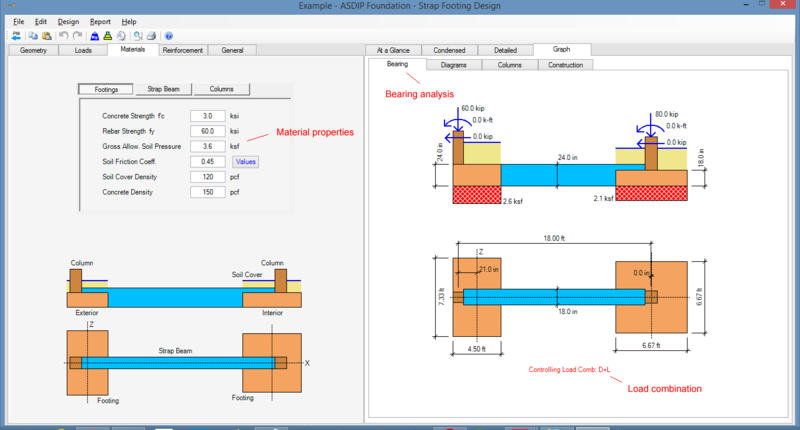 This software computes the soil bearing pressures induced by a cantilever footing under the action of vertical loads and bending moments, per the latest ACI design criteria. It designs the reinforcing steel, and checks the one-way and two-way shear stresses. In addition, the program generates the shear force and bending moment diagrams in order to design the reinforcement in the longitudinal direction. The concrete design is based on the Ultimate Strength Design Method of the ACI 318. Load combinations per the ASCE 7. The input options are conveniently designed in tabbed pages. The required input data includes the footing and columns dimensions, the material properties, the allowable soil bearing pressure, and the acting service and factored loads. In addition, the program accepts a number of load cases, such as dead, live, snow, wind and seismic, to be combined internally. Alternatively, you can input a set of pre-combined loads. The software checks the footing stability in overturning, sliding and uplift under the service combined loads, and performs the concrete design, which includes the one-way shear, punching shear and bending under the factored combined loads. In each case the controlling load combination is identified and reported. 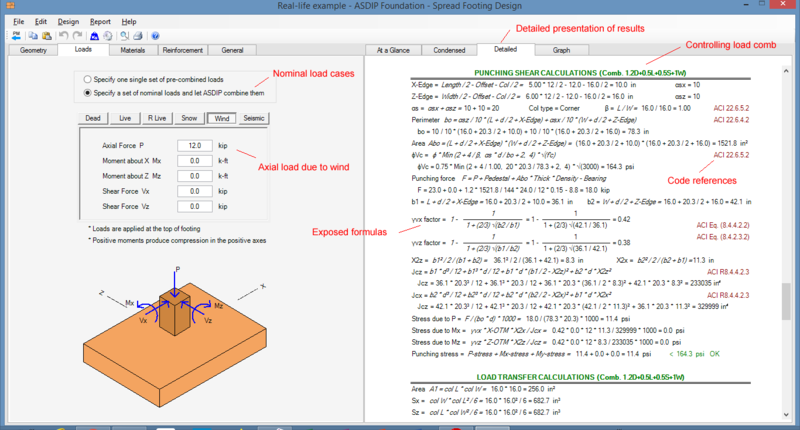 ASDIP Foundation generates a graphical view of the designed footing and the resulting pressures and forces, as shown. The program also generates the moment and the shear diagrams for the controlling combination, as well as a view of the construction section and elevation with the reinforcement information. The image gallery below shows annotated screen shots of the software. Click on any image to enlarge. Any Windows® Operating System. No additional software required. Versatility to model a full set of load combinations, or just a single pre-combined load. Specify water table location for buoyancy check. Customizable design criteria, options, and conditions. Rich user interface to model the geometry, materials, loads and rebars. Multiple load cases such as dead, live, roof live, snow, wind and seismic. Column may be eccentric on footing in both directions. 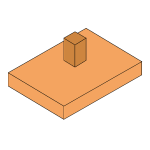 Column can be modeled as a short pedestal supporting a steel column. New clean and uncluttered layout design. 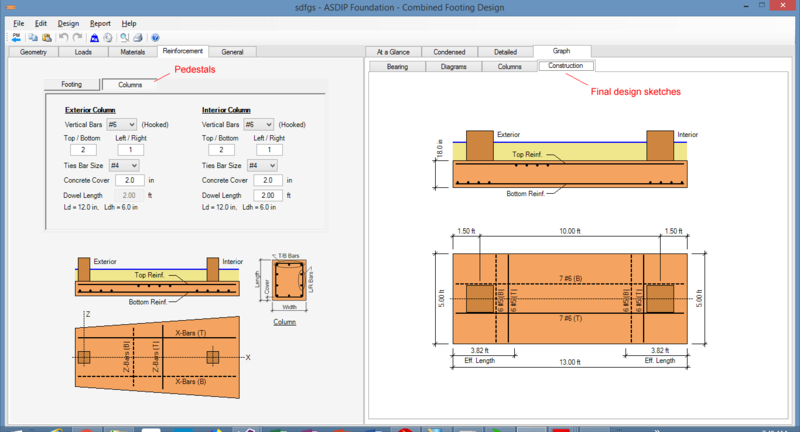 Multiple visual controls to model the reinforcing steel. Combined footings can be either rectangular or trapezoidal. Specify proportion of passive and friction acting together for sliding resistance. Change any parameter and see the effect immediately for what-if analysis. Complete design of footing and footing-column interface. 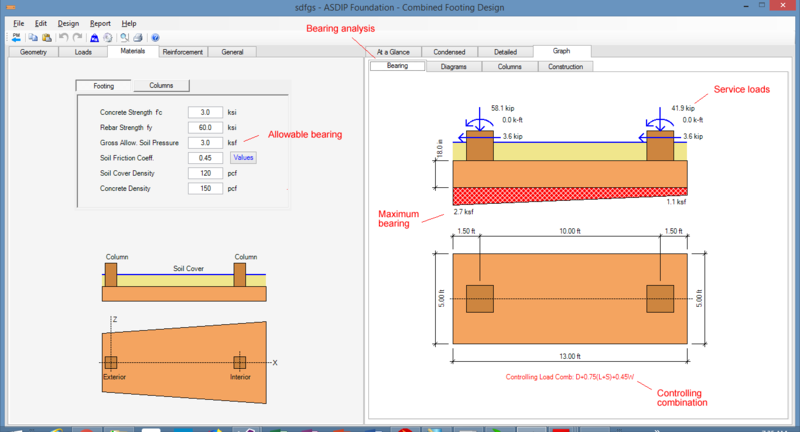 Complete stability analysis for overturning, sliding, uplift, and bearing. Graphic display of bearing pressures, one-way shears, punching shears, and moments. Column / pedestal structural design included. Percentage of passive / friction acting together. 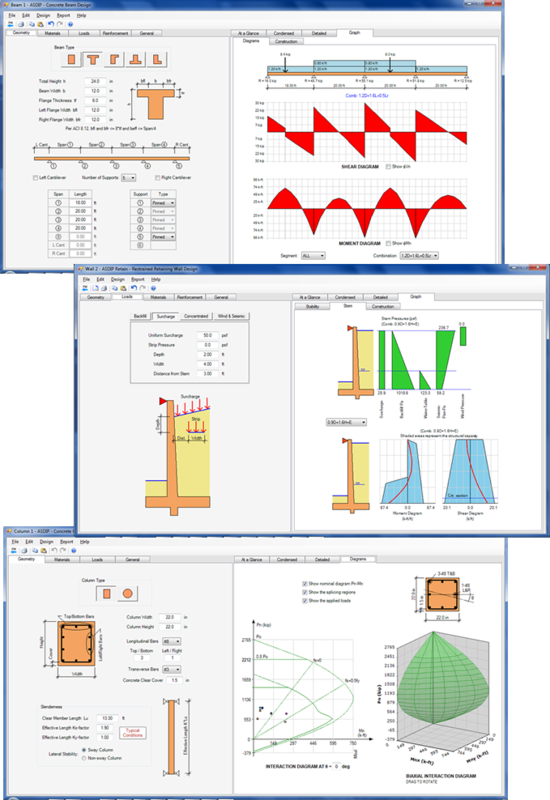 Software finds the controlling combination for each condition to optimize design. Exact mathematical solution of bearing pressures, shears and moments under biaxial loading. Combined text-with-values output message updated with each change. Outstanding output with Print Preview. Three ways to show the calculations: At-a-Glance, Condensed, and Detailed. Construction sketch of your footing updated with each change. Project Manager handles calculations and files for you. You are in complete control of every single aspect of the design. Design your concrete footings in minutes (not hours). Verify every design step quickly. Not a “black box”. No silly assumptions or math shortcuts. Confident, accurate, and reliable results. Focus your attention on engineering, and let ASDIP FOUNDATION handle all the mathematical complexity. Multiple calculations stored in a single project file. 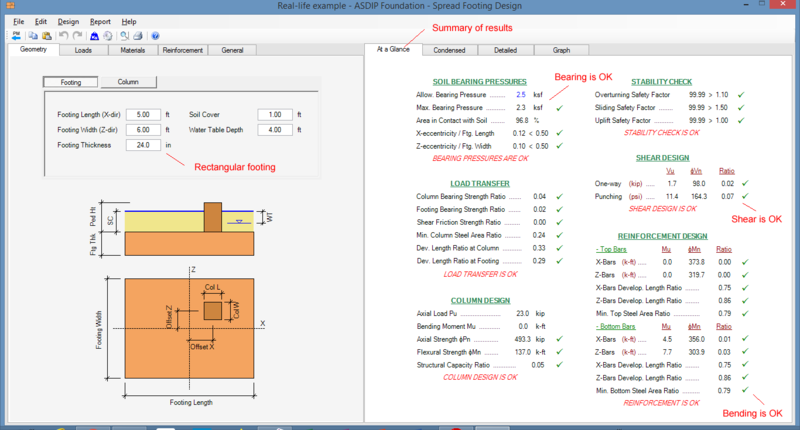 I recently purchased all four of the ASDIP structural engineering software modules. After using this engineering software for a few months I believe it works very well for its intended purpose. ASDIP is very simple to use, is reasonably priced, and the calculation output is organized with a nice looking readable layout."